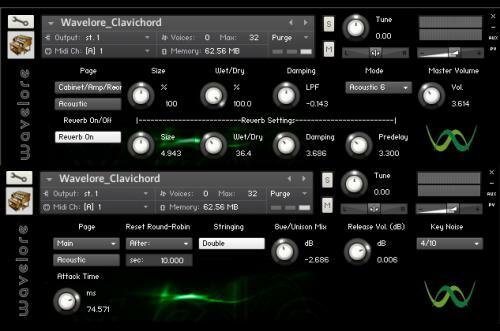 Wavelore Clavichord v1.0 KONTAKT-VON.G - 軟件 - 香港人網 線上討論區 網上電台 | 論壇 | 網絡廣播 - Powered by Discuz! The Wavelore Clavichord ($179.99) (Kontakt 4 and higher) is the world's first deeply sampled and programmed virtual clavichord. This rare and beautiful keyboard instrument was a favorite of renaissance and barouque composers, as well as a popular practice instrument for organists (it's extremely quiet! ), though it fell into relative obscurity starting around the early nineteenth century. In the twentieth century, it's best known, perhaps, in the form of its electronic offspring, the Hohner Clavinet, which we all know to be one the funkyiest sounding instruments on record. See Stevie Wonder's "Superstition" for a well known example. The clavichord is considered by some to be the most intimate of keyboard instruments, mostly due to the fact that the player's fingers are more directly in contact with the strings; The most unique aspect of its construction is that it allows the player to rock his or her finger on a key, producing a vibrato effect, or "bebung"...poly aftertouch well before its time! The Wavelore Clavichord faithfully reproduces all the defining and unique capabilites of its acoustic namesake, while also adding certain capabilities. See below for full feature list. Intimate malleable sound, close mic'ed samples and stereo impulse reponses for enhanced cabinet resonance. Characteristic release samples, accurately reflecting tangent buzz - adjustable in volume with carefully programmed decay-matching (so release samples don't "pop"). Configurable Keynoise samples for all notes, including a wide array of control options for performance detection. Of course, you can also just shut 'em off! A dozen temperaments suitable for modern and period music: Equal, Pythagorean, and a variety of meantone and circulating temperaments. Optional octave/unison string coupling with fine de-tuning control over each string of each key. This feature also allows the use and adjustment of "tangent slope", or the tendency of either member of a string pair to sound later than the other, based on the angle or "slope" of the tangent's edge. Together these controls can greatly enrich the instrument's sound, or even be used to simulate an instrument in varying stages of disrepair! Ability to apply vibrato to only the last note played using an assignable MIDI controller, and including optional randomization of vibrato width and speed for a more "human" effect than typical LFO-based vibratos. Also includes an optional multiscript that allows the use of polyphonic aftertouch for true "bebung" technique. "Electric" or "Acoustic" mode: Apply a variety of cabinet or amp resonances, as well as optional, keyswitchable wah, distortion, compression, and reverb. MIDI Learn mode for all assignable controls. A feature-rich, dynamic performance view with nine pages of clearly organized and intuitive controls for tweaking the instrument to your taste and style. Carefully chosen factory settings to allow unsurpassed out-of-the-box playability. A detailed 22-page user guide .pdf including a quick start guide and detailed info on operation.